This chapter reports on the performance of governments in providing child protection, out-of-home care, family support services and intensive family support services. Nationally, 49 315 children aged 0–17 years were the subject of a substantiation in 2016‑17. 47 915 children were in out-of-home care nationally, 17 664 of whom were Aboriginal and Torres Strait Islander. Total recurrent expenditure on child protection, out-of-home care, family support services and intensive family support services was $5.2 billion nationally in 2016-17 — a real increase of 8.5 per cent from 2015-16. Child protection services provide supports and interventions to promote child and family wellbeing, and to protect children and young people aged 0‑17 years who are at risk of abuse and neglect within their families, or whose families do not have the capacity to provide care and protection. meet the needs of individual children and young people in the child protection system. Governments aim for child protection services to meet these objectives in an equitable and efficient manner. 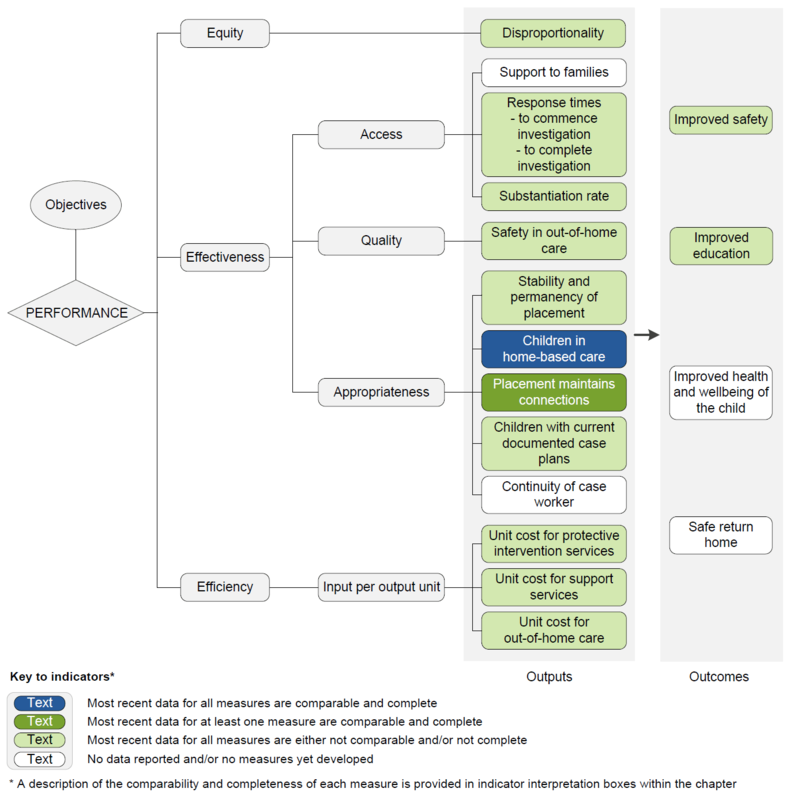 The performance indicator framework provides information on equity, efficiency and effectiveness, and distinguishes the outputs and outcomes of child protection services. The performance indicator framework shows which data are complete and comparable in the 2018 Report. An overview of the Child protection services performance indicator results are presented. Information to assist the interpretation of these data can be found in the indicator interpretation boxes in the Child protection services chapter and attachment tables. 3.90 4.69 4.06 5.22 5.13 1.27 4.33 1.79 ..
3.48 2.70 na 3.36 7.03 na 9.44 1.88 ..
4.70 6.87 4.08 6.27 6.97 1.75 8.48 1.88 ..
5.38 7.55 4.47 6.79 6.81 1.81 9.82 2.05 ..
6.86 12.35 5.32 8.43 7.37 2.73 10.26 2.09 ..
7.07 12.77 5.36 8.59 7.31 2.72 10.23 2.10 ..
2.5 1.0 na 0.2 2.8 na 0.4 na ..
858 1421 1677 2259 2728 1970 1215 486 ..
10 423 7 888 na 9 153 23 696 2 549 12 924 11 680 ..
4.5 5.6 3.8 3.8 6.2 7.2 6.8 3.0 ..
9.5 15.4 10.1 12.8 13.3 15.9 14.3 11.8 ..
9.1 3.0 7.4 5.5 7.1 8.1 6.1 7.7 ..
15.4 14.3 17.8 17.3 15.2 23.5 16.3 22.6 ..
86.0 79.2 78.0 80.1 78.9 79.2 88.2 66.7 ..
74.9 71.5 64.5 64.8 62.9 70.2 88.9 41.7 .. These data and caveats for these data are available in chapter 16 and attachment 16A. na Not available. .. Not applicable. np Not published.